Horizon Yacht Australia will showcase two luxury yachts – the all new Horizon V81 motoryacht and a brokerage E88 motoryacht – at the 51st Sydney International Boat Show at Cockle Bay Marina in the beautiful Darling Harbour, Australia from August 2nd to August 6th, 2018. 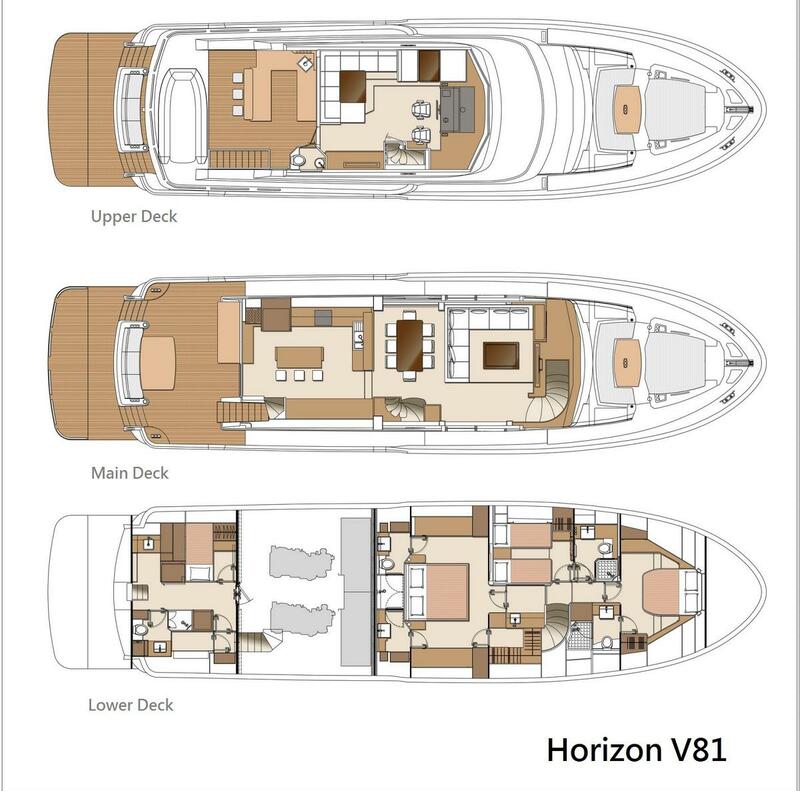 The long awaited arrival of the Horizon V81 is expected to make waves with guests at the Sydney show. The newly designed V81 Horizon motoryacht comes from the well-known V series and features design changes that enhanced the popular V72 model to make it even more appealing. Offering unparalleled interior volume and expansive exterior entertaining areas, the V81’s interior spaces are uninterrupted; she offers a flush deck galley-to-saloon transition, floor to ceiling windows on the main deck, and streamlined lower deck windows that maximize natural light as well as enhance exterior styling. 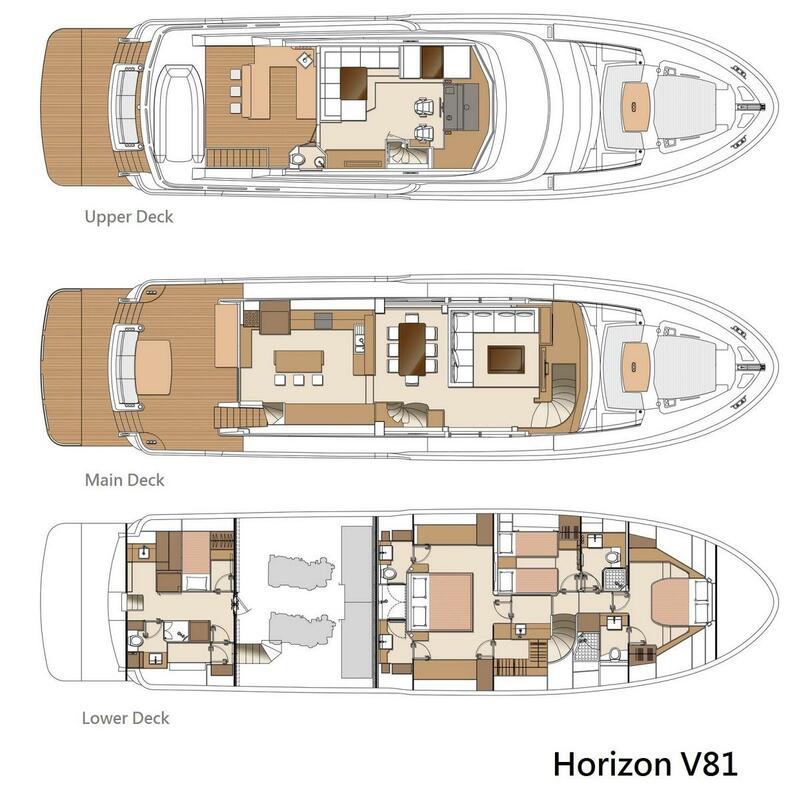 Below deck, the Horizon V81 luxury yacht provides comfortable accommodations for up to six guests in three en-suite staterooms, which includes a King master stateroom, Queen VIP stateroom, as well as a twin guest stateroom. Crew quarters and a work space can be found aft of the engines. Moreover, the pilothouse features a protected space to pilot the vessel as well as a day head and dinette for guests; there is also a full bar on the boat deck, with plenty of room to store a tender. Powered by twin CAT C18A 1150hp, the V81 offers increased and efficient performance in addition to a comfortable long range cruising to the location of your choice. The V81 is flexible enough to satisfy an owner/operator or a crewed lifestyle. Also on showcase is the Horizon E88 enclosed bridge motoryacht, which is a contemporary-styled vessel combining a performance-oriented hull with a sleek superstructure, all the while retaining the family resemblance to the other models in the E Series. The inspiration from her designer, John Lindblom, derives from the demand for an increasingly modern look with a keen eye for classic lines. The interior layout offers four private guest staterooms plus crew quarters aft, as well as a voluminous main deck area complete with a salon, formal dining, galley and country kitchen. This E88 motoryacht inherits Horizon’s successful concept of ensuring living comfort with spacious accommodations. Horizon Yacht Australia invites you to their display at the 2018 Sydney International Boat Show, located at Berth 230-231; for more information or to register for VIP viewing, please contact Erica from Horizon Yacht Australia at erica@horizonyachtaus.com or call 07 5577 9009.